When light travels from air into water, which of the following statements is accurate? The wavelength decreases, and the speed decreases. The wavelength decreases, and the speed increases. The wavelength increases, and the speed decreases. The wavelength increases, and the speed increases. This is College Physics Answers with Shaun Dychko. So light is traveling from air into water and we want to figure out what happens to the wavelength and the speed of light? So we can create some formulas for speed and wavelength. 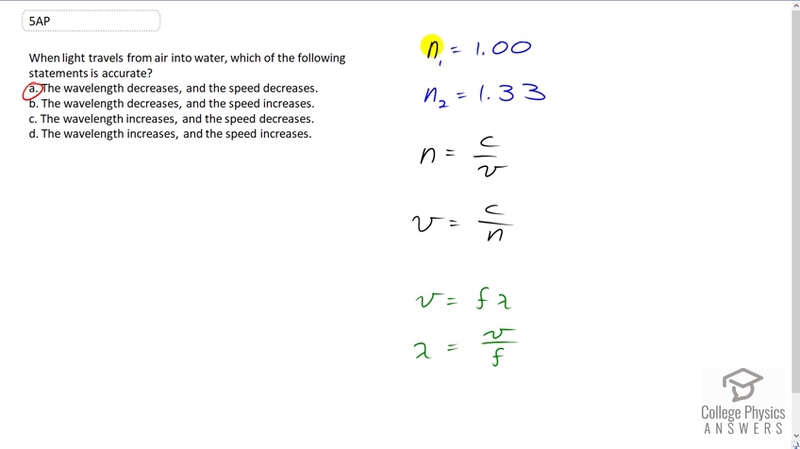 Now we know that index of refraction of air is 1.0 and it's refraction for water at 1.33 and this index refraction fraction in general is the speed of light in a vacuum divided by speed of light in medium and then we can solve this for v by multiplying both sides by v over n . And so we have the speed in the medium is the speed of light in a vacuum divided by the index of refraction. And so now we can talk about how the speed changes so as index of refraction goes up as it does in this case because we're going from one to 1.33 the speed goes down so because the index Refraction is in the denominator. And another reason you could say that is because well if the speeds are going to change it has to get something less than the speed of light because nothing faster than the speed of light. But mathematically speaking here we have the denominator increasing and so the quotient to the decreasing. So the speed is decreasing, in other words. That narrows down our options to either A or C . Then we can talk about wavelength and we know that this speed is frequency times wavelength that's the wave equation and then we'll solve this for LAMDA by dividing both sides by f. And so the wavelength is the speed divided by frequency. And now if the speed is going to be decreasing that means the wavelength is also going to be decreasing since it's directly linked directly proportional to the speed and so that means the answer is A.